Seen everywhere from your dance classes to your favourite films, body popping is a popular form of street dance that grew out of the funk tradition of the 70’s and was carried into the breakdance movement of the 80’s. It lives on today through the creativity of contemporary hip-hop dancers. In popping, the dancer tenses his or her muscles to create a sudden jerk in either the upper, lower, or entire body. When performed in succession, these ‘jerks’ can create the illusion of stunted animation, making the dancer look like a robot or a cartoon character. Though difficult to master, popping is a form of dance that many beginner street dancers endeavour to learn for its playful nature and its ability to impress and entertain an audience. When learning to pop as a beginner, remember that the key is to follow the rhythm of the music. Funk music works best for learning to pop as it’s easy to find the beat and hear where your ‘pops’ should go. Choose a single body part to start with. Most dancers begin with the arms. Stretch them out in front of you, but do not lock your elbows. Listening carefully to the music, count every two beats and tense all the muscles in your arms. Be careful that you are not locking your joints or straightening the arms. Instead you should simply contract all the muscles instantaneously and then immediately release. Your arms will not change position but will look like they’re jolting, as if tiny electric shocks are making them jump to the music. Once you’ve mastered this, try it double time, contracting on every beat. After you’ve practiced for a while, be sure to stretch out your arms thoroughly before moving on to something else. This will help prevent soreness later on. If you want to move on to your legs, you should stand with your feet hip-width apart. Begin by shifting your weight from one side to the other, without lifting your feet from the ground. As you shift to each side, snap your kneecap back as you straighten your leg. Be gentle until you get the hang of it, but you should be hyperextending your leg. Again, once you get it you can try it twice as fast. Then try doubling up with two pops on each leg. Once you’ve worked on popping your arms and legs, you can begin to work on your chest and neck. These are more difficult but follow the same principle of flexing and relaxing all the muscles. This can be easier for male dancers due simply to physical muscle makeup in the torso, but this doesn’t mean that females can’t pop. It just means that it might take some extra practice and exercise. Once these movements have been practiced individually, you can piece them together to pop your entire body. To truly learn how to pop, it takes more than a few simple verbal instructions. The best poppers learn by taking class from other more experienced dancers, watching music and dance videos, and taking inspiration from other (perhaps less obvious) sources. In doing so, an individual dancer is able to put his or her own spin on the movements and create a personal style. 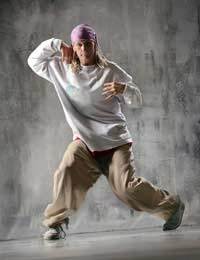 In order to really master the dance form, take class from as many different teachers as you can, watch music videos and films featuring hip-hop and breakdance, and even observe animated or claymation characters that move in an interesting way. Using all your resources will allow you to absorb a larger movement vocabulary and to make that vocabulary your own. And as new generations of hip hop dancers learn and grow, body popping and street dance as an entity will be made a stronger and more diverse dance form.